Jump training starts when the young horse is 3 or 4 years old and has mastered all basic flat work, including the walk, trot, canter, halt and reverse. Before you start young jumping horses, consider performing regular lateral exercises as well. Building top line strength and increasing lateral flexion will help your horse jump correctly from the start. Leg and seat aids are crucial when teaching the young horse to jump. On the approach to the obstacle, push with your legs and seat to encourage the horse forward. Maintain light contact through the reins, but guide with your legs more than your hands. Let your horse find his way to the jump. Over the obstacle, execute a generous crest release to avoid catching your horse in the mouth. If your hands hit the bit, the horse will associate jumping with pain. On the downside of the jump, collect your horse and ride in a straight line for at least five or six strides to emphasize balance. When training jumpers, always work at a slow pace so your horse's body acclimates to the increased demands on his skeletal system and musculature. Ground poles or cavaletti are a low-stress starting point. Trot and canter your horse over a single ground pole, then progress to multiple cavaletti in a line. For trot work, leave four feet between poles; for the canter, separate poles by 10 feet. When working over cavaletti, do not encourage the horse to jump. Instead, remain in your flat work position and let the horse simply step over the poles. Once your horse is balanced and relaxed over cavaletti, set up a single cross-rail or "X" about a foot tall. Approach the cross-rail at a brisk trot, and make sure to steer the horse toward the center of the "X". Horses sometimes drop their heads or slow down when approaching their first jump. To stay out of your horse's mouth, give an automatic crest release so you stay balanced over your horse's back. This will prevent you from tipping forward and throwing off your horse's center of gravity. Your horse might over-jump the obstacle, so prepare for an exaggerated crest release. Practice cross-rails and low verticals one at a time, increasing height in six-inch increments. If your horse balks, ask him to follow a more experienced horse over the fence. Since horses possess a herd mentality, they are more likely to cooperate when they see other horses perform an exercise. A gymnastic is a line of fences. A bounce includes two or more jumps between which the horse does not take a stride. When his hind legs land from the first jump, his front legs take off for the next. You can build gymnastics with bounces as well as one-, two- and three-stride combinations. These exercises build your horse's strength, flexibility and confidence, and help perfect his form over fences. They also help horse and rider develop their rhythm over fences. Work on cavaletti, single jumps and gymnastics for at least six weeks. When he performs these exercises in a relaxed manner and with no stiffness or soreness, progress to courses. 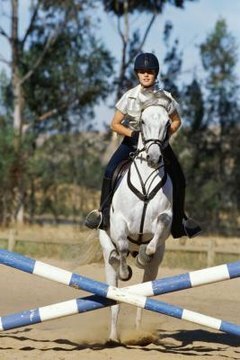 Start with small courses involving just three or four fences, such as a single vertical with a left or right turn to a three-stride line. Work up to full courses of 10 to 12 obstacles. If your horse begins running out or refusing fences, regress to the basics. Return to gymnastics work at least once every two months to reinforce his training.